Guests can go for a row on the farm dam or spend a relaxing afternoon bass fishing. The wide open spaces at Klein Paradijs are wonderful for playing all kinds of outdoor games. Birdwatching opportunities abound on the property (click here for the list of 96 different types of birds sighted on the estate). For the energetic, climbing the Wolfhuiskop with its breathtaking view (274 m) will be a rewarding experience. Guests are also welcome to explore the local fynbos, accompanied by an accredited guide if desired. The main attraction of the property is its fynbos or indigenous vegetation. Fynbos is the popular name for the shrub-like vegetation found at the southern tip of Africa. This region, which is also known as The Cape Floristic Region boasts a rich diversity of species. What is more, many of the plants are found nowhere else in the world. Fynbos is characterized by four main plant species: colourful proteas, bell-shaped ericas, reed-like restios and geophytes (plants with bulbs, tubers or corms). Most plants flower in winter and spring (June to September), but there is something to see at every time of the year. At Klein Paradijs, great efforts have been made to clear the land of invasive foreign plants and to restore it to its pristine condition. Recently, a part of the property was registered as a Voluntary Conservation Site with Cape Nature. The Overberg region of the Western Cape is known for its rolling hills, patchwork-like farmlands and the rugged coastline with its pristine beaches. 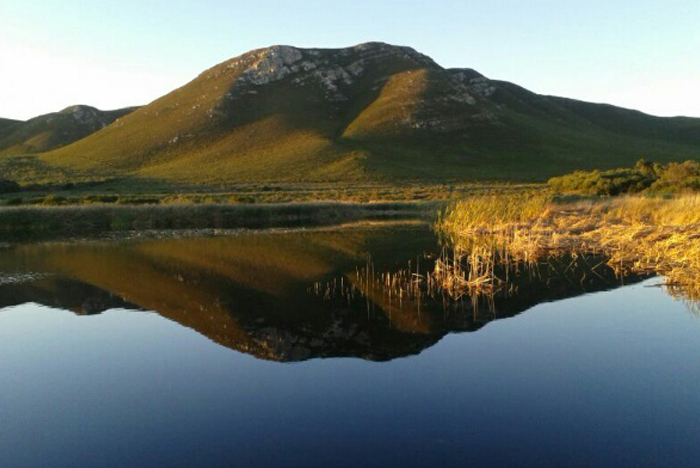 The name Overberg refers to the days when this part of the country was difficult to access “over the mountains”. Today, the Overberg is easy to reach by car on the N 2, R 43 or the R 44 (coastal road). The region is home to a number of picturesque farming villages, quaint hamlets, buzzing coastal resorts and fishing villages and interesting nature reserves, all worth a visit. Pearly Beach is a popular destination for Capetonians on weekends and holidays. Its attractions are the unspoilt beaches and good angling. The quaint hamlet of Baardskeerdersbos, literally meaning “beard shaver’s bush”, is thought to have obtained its name from a ten-legged spider-like creature called a solifuge, which has mandibles that look like the clippers used for shaving in the olden days. The hamlet has a general store, a historic church which is very popular for country weddings and an old school building which is used as a social venue. It also has a vibrant community of artists and crafts people and it has a popular farmers market once a month. The Uilenkraalsmond lagoon is well-known for its shallow water providing safe swimming conditions, its bait collection sites and abundance of water birds. The drive between Franskraal and Kleinbaai, two holiday villages, is very scenic. This stretch of coastline is dotted with unspoilt beaches and rocky promonteries. At the entrance of Franskraal a walking trail through the remnants of an old milkwood forest allows visitors to gain an impression of what the vegetation in this area must have looked like hundreds of years ago. A small museum on the water’s edge documents the history of this coast. The name of the small holiday village of Kleinbaai is known the world over, as it is the harbour from which the shark viewing boats launch every day. Boat trips to see Dyer Island, which is the home to a large flock of African penguins and Geyser Island with the largest colony of breeding seals in South Africa, also start from this harbour. In addition, Kleinbaai has a very well-maintained 9-hole golf course. The Danger Point lighthouse near Kleinbaai marks the spot where the HMT Birkenhead ran aground in 1852. This historic shipwreck will always be remembered for the gentlemanly gesture of the soldiers of allowing “women and children to go first” and board the life boats. Gansbaai (Goose Bay) is thought to be named after a colony of Egyptian geese that lived by a fresh water fountain in the old harbour. Gansbaai has it origins in a fishing village and to this day the fishing industry plays an important part. Today, Gansbaai also has a thriving tourism industry and as a result has become a bustling town with supermarkets, banks, restaurants, a post office and much more. The 7-km Klipgat Hiking Trail meanders along the coast from Gansbaai to De Kelders and Die Plaat in Walker Bay Nature Reserve. De Kelders is known for a cave with a natural fresh water pool which was discovered four years before the Cango caves in 1776 and called the Drupkelder. Excavations at another cave called Klipgat have revealed archaeological deposits left by Middle Stone Age people and the Khoikhoi of the Later Stone Age. From June to November the cliffs at De Kelders afford spectacular views of Southern Right whales (Eubalaena Australis) which come to the protected bays of the coastline to mate and calve. In summer they return to Antarctic waters. The whales were given their name in the whaling days because they were considered the “right” whale to catch: They were slow, floated when caught and were rich in oil and baleen. They are easily identified by their “V” shaped blow and the bumps on their heads called callosities. Other good whale watching spots are Pearly Beach, Hermanus and De Hoop Nature Reserve. Stanford is a small farming village on the Klein River. It takes its name from Sir Robert Stanford, who bought the farm on the site where today’s village is situated in 1838. Stanford was involved in a dispute between the locals and the British government concerning plans to settle convicts at the Cape and eventually left the country in disgrace. The farm was subdivided and a town laid out on it. Stanford’s irrigation channels, its well-preserved buildings and its market square lend the town its old-world character. Stanford has some lovely little restaurants and shops. The Klein River is an excellent place for bird watching. Boat trips are offered on the lagoon. A microbrewery and an award winning dairy are located just outside Stanford and are well worth a visit. Hermanus, the Riviera of the South, was discovered by Hermanus Pieters in the early 1800s. He was a teacher and shepherd at a farm in Caledon and found the place, which one day would bear his name, to have a fresh spring and good grazing for his livestock. Soon Hermanuspietersfontein became a popular place for inland farmers to spend the summer months. Fishermen also came to settle in the area. By the early 1900’s the village, which was then known as Hermanus, became a popular destination for convalescents from overseas. Sir William Hoy the general manager of the South African Railways was one of the first regular visitors to Hermanus. He blocked all attempts to extend the railway lines from Bot River to ensure that the village remained unspoiled. It is because of him that Hermanus has a railway station, but no access to a railway line. Today, the station building houses the tourist information facilities. Hermanus has become an all-year destination for travellers. It offers a myriad of restaurants and shops as well as beautiful beaches, a premier golf course, an extensive nature reserve and outstanding land-based whale watching from June to November. On the outskirts of Hermanus, in the Hemel-en-Aarde Valley, several vineyards are making their mark on South Africa’s vinicultural map and are worth a visit. Napier is the home of a thriving farming community. The picturesque village is also known for its private collection of ox wagons and carts. A horse and cart festival is held in autumn. Napier also has a number of specialized small museums, several farm stalls and antique dealers. Bredasdorp is a sizeable farming town. It is the home of the shipwreck museum. The museum contains objects found from shipwrecks along the Overberg coastline, also called “the graveyard of ships”, over the years and tells the stories of these tragic incidents. The candle factory selling hand-crafted gifts has also become a popular destination for visitors. Arniston is named after a ship that was wrecked off the coast in 1815. The village also goes by the name of Waenhuiskrans because of its tidal cave in which an ox wagon and span of oxen are said to be able to turn around. The cave can be accessed at low tide. The 200-year-old Kassiesbaai fishing village with its traditional whitewashed and thatched cottages is a national monument. Cape Agulhas is the name of the southernmost tip of Africa. It is also the place where the Indian and Atlantic Oceans meet. The southernmost tip is marked by a small monument depicting the caravel in which Diaz rounded this point in 1487. There are many rock pools to explore with all kinds of intriguing marine life. The working lighthouse was built in the style of the Pharos of Alexandria. It is open to the public and houses the lighthouse museum. The Agulhas National Park was proclaimed in 1999. Elim, founded by Moravian (German) missionaries in 1824, is well-known for its skilled thatchers and its flower export industry. The Moravian church is a national monument and the clock tower houses one of the oldest clocks in South Africa. Elim is the home of the only monument in South Africa commemorating the freeing of the slaves in 1838. Many freed slaves subsequently settled in Elim and other mission stations in the Cape. The Elim area has recently been proclaimed as a Wine of Origin ward. It is now the southernmost wine producing area in the country. Several wineries are open for wine tasting.